What changes will make the 2018 Chevrolet Suburban and Tahoe different? Revised styling, upgraded transmissions, revamped feature packaging, and addition of a 420-horsepower high-performance version of the Tahoe. Also debuting will be Rally Sport Truck (RST) versions of both the Suburban and Tahoe devoid of almost all chrome and riding massive 22-inch wheels. These updates mark the midcycle refresh for Chevrolet’s pair of full-size, truck-type SUVs. Tahoe and Suburban use old-school body-on frame construction, can seat up to 9 passengers, and share basic engineering and drivetrains with Chevy’s Silverado 1500 pickup truck. Even at some 17 feet long, 6 feet tall, and 7 feet wide, Tahoe is actually the smaller of the two vehicles. Suburban is 2-feet longer overall and rides a 14-inch-longer wheelbase (the distance between the front and rear axle), resulting in more cargo space and room for occupants in the third seating row. Chevrolet-parent General Motors sells rebadged versions of these trucks as the GMC Yukon and Yukon XL. The Cadillac Escalade and Escalade ESV are also based on this platform, though they have more distinctive styling, a larger standard engine, and much higher prices. Demand for full-size SUVs is well off its peak 10-15 years ago, but there are still plenty of folks who desire the capability these rigs offer. Tahoe sales alone nearly equal the combined sales of the non-GM entries in this class, the Ford Expedition, Nissan Armada, and Toyota Sequoia. Bundle the numbers and Tahoe, Suburban, Yukon, and Yukon XL give GM nearly 70 percent of the non-premium full-size-SUV segment. Why should I wait for the 2018s? To get the most up-to-date styling, drivetrains, and features. Every ’18 Tahoe and Suburban is expected to come standard with at least an 8-speed automatic transmission, replacing the current 6-speed. New for both trucks will be the Rally Sport Truck (RST) Special Edition, bringing unique styling and suspension tuning. RST Tahoes will be available with an optional Performance Package that includes a larger, more powerful engine, a 10-speed automatic transmission, and the promise of still-sharper handling (more on this below). Aside from the RST versions, the 2018 Tahoe and Suburban lineup should be a repeat of their model-year ’17 roster, with base LS models, volume-selling LT grades, and flagship Premier trim levels (Premier replaced LTZ for ’17). A V-8 engine and rear-wheel drive will again be standard four-wheel drive (4WD) will remain available for an extra $3,000 or so. 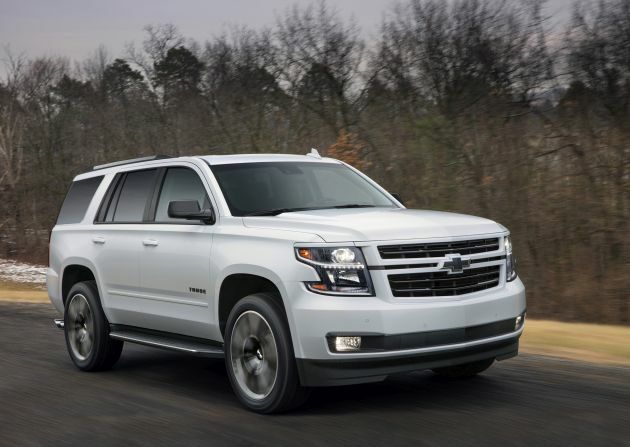 The current-generation Tahoe and Suburban debuted for model-year 2015. In years past, large SUVs and the pickup trucks upon which they were based would have a shelf life of roughly 8-10 years. Increased demand for pickups, though, is driving the industry to refresh and even redesign those products more frequently. By extension, the SUVs are receiving similar updates. Ford redesigned its Expedition and the related Lincoln Navigator for model-year ’18. And Nissan repositioned its 2017 Armada on the platform of the QX80 from its premium Infiniti division. If you’re OK with their slightly dated styling and 6-speed automatic, go for it. The upgraded transmissions promise to provide the 2018 models with improved performance and fuel economy. But RST versions excepted, the 2017 Tahoe and Suburban are unlikely to ride or handle much differently than the freshened ’18s. And the ‘17s already are packed with just about every feature one could reasonably demand. Buying a 2017 helps you elude year-over-year price inflation, and deals should get particularly attractive thanks to clearance sales to make room for the updated ‘18s. The 2017 Tahoe and Suburban are smooth and quiet, with refined drivetrains and plenty of family-friendly safety and convenience features. There are, however, a couple areas where they fall short, relative to the competition. We’ll touch on that in the next section. Yes, but probably only subtly. Expect updates to the front and rear fasciae and a restyled grille and headlights. Some new color choices are likely, too, as are fresh wheel designs in returning 18-, 20-, and 22-inch diameters, depending on trim level. Aiming for what Chevy calls a “street performance” look, the RST versions will have a gloss-black grille with a body-color surround; gloss-black mirror caps, black roof rails, window trim, badging. and Chevy bowties. RST also includes exclusive 22-inch wheels. Interior changes to all models may include a new steering wheel, along with the latest version of Chevrolet’s intuitive MyLink infotainment system with support for Apple CarPlay and Google Android Auto. The driver, front passenger, and second-row occupants will again enjoy plenty of room on cushy seats. Depending on trim-level, you should again be able to choose from two buckets or a three-place bench seat in both the first and second rows. All models will continue with a split/folding third-row bench, but if you want a semblance of adult-worthy accommodations back there you’ll again need to look toward the Suburban, with its longer wheelbase. Even then, third-row room and comfort will likely remain at the back of the pack. The culprit is GM’s use of a solid-axle rear suspension rather than the more sophisticated independent suspension in the Armada, Expedition, and Sequoia. 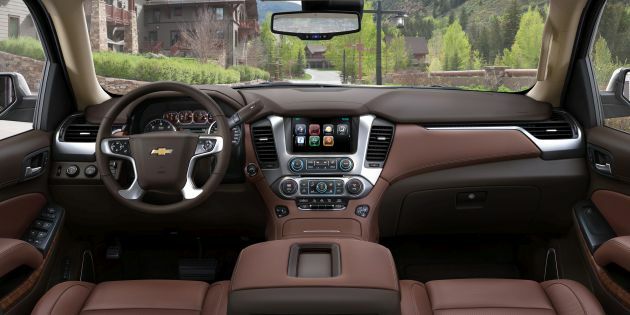 The bulkier GM setup dictates a higher rear floor, compelling third-row passengers to ride knees-up and, in the Tahoe, leaves little room for feet beneath the second-row seats. Cargo volume with the third-row folded is generous in both the Tahoe and Suburban, though only in the latter is it plentiful with the third-row occupied. Finally, if you’re interested in the Suburban, swing by your house on the test drive to make certain it’ll fit in your garage. Yes. Expect nearly all 2018 Tahoe and Suburban models to come standard with an eight-speed automatic transmission in place of their current six-speed automatic. The updated gearbox is the same one already in many Silverado models and it’s an excellent match to what’s expected to be the 2018 Tahoe/Suburban carryover standard engine. That smooth, proven 5.3-liter V-8 should again make 355 horsepower and 383 pound-feet of torque. The new transmission should further improve throttle response and boost fuel economy. Carried over will be a full-time 4WD system, meaning driver-selectable rear- or four-wheel drive, with the 4WD system capable of being left engaged on dry pavement. It would also continue to include low-range gearing for demanding off-road conditions. Employing body-on-frame construction rather than car-type unibody engineering supports hefty towing capacities, and ’18 Tahoes should again be rated to pull trailers up to 8,600 pounds, with Suburbans again capable of trailering up to 8,300 pounds. While the RST package is essentially cosmetic, Tahoes and Suburbans with it can be additionally fitted with a Borla performance exhaust system for which Chevy claim a 28 percent improvement in exhaust flow for a 7-10-horsepower gain at the rear wheels. An available brake package features front red Brembo six-piston, fixed aluminum calipers and larger-than-stock Duralife rotors for what Chevy says is an 84 percent increase in brake pad area and a 42 percent increase in rotor area. The automaker says Duralife rotors feature a hardened surface to reduce corrosion and provide quieter braking with less vibration. Optional for RST Tahoes will be the Performance Package and it’ll install the 6.2-liter V-8 from the Escalade and Yukon Denali. It’ll produce 420 horsepower and 460 pound-feet of torque and team with a 10-speed automatic transmission. The package also includes a performance-calibrated version of GM’s excellent Magnetic Ride Control adaptive suspension, which automatically reacts to the road surface to optimize both ride and handling. GM says a Tahoe so equipped can do 0-60 mph in less than 6 seconds. Possibly. EPA fuel-economy ratings for the 2018 Tahoe and Suburban were not released in time for this report. Assuming the eight-speed automatic transmission replaces the six-speed, mileage may improve slightly over 2017 ratings. For reference, those were 16/23/19 mpg city/highway/combined with rear-wheel drive for both the Tahoe and Suburban. With 4WD Tahoe, rated 16/22/18 mpg and Suburban 15/22/18. The eight-speed transmission could improve these numbers by 1 mpg across the board. Expect Tahoe and Suburban RST models to rate at least 15/22/17 mpg city/highway/combined with rear-wheel drive and 15/20/17 with 4WD. All 2018 Tahoes and Suburbans would carryover a fuel-saving system that idles four cylinders while cruising and under light throttle load. Those equipped with the 5.3-liter V-8 would use regular-grade 87-octane gasoline and/or E85 ethanol-blended fuel. GM would recommend (though not require) pricier 91-octane premium gas for the 6.2-liter engine. The RST brings a number of new features, mostly the mechanical ones discussed above. For the rest of the lineup, there probably won’t be too much that’s all new. Chevrolet could re-package existing items and make more equipment standard on lower trim levels. For example, we wouldn’t be surprised to see the programmable power liftgate that’s standard on LT and Premier to be added to the LS. Or, blind-spot and rear cross-traffic alert could become standard on the LT, where it’s currently only available as part of pricey option packages. With few minor exceptions, Tahoe and Suburban will have identical standard and optional equipment. Returning as standard on all models would be Chevrolet’s MyLink infotainment with 8-inch touchscreen display, rearview camera, onboard WiFi hotspot via GM’s OnStar telematics, rear-obstacle detection, 10-way power driver seat, fold-flat second- and third-row seats, remote engine start, and tri-zone automatic climate control. LT models would add leather upholstery with heated front seats, Bose-brand audio system, automatic high-beam headlight control, forward-collision warning, autonomous emergency braking, and automatic steering correction should you wander from your lane. Premier buyers would get HID headlights with LED daytime running lights, front-obstacle detection, Magnetic Ride Control, 20-inch wheels (up from standard 18s), power tilt and telelscopic steering column, heated and ventilated 12-way power front seats, power-release second-row seats, and power-folding third-row seat. We expect the RST to reside between the LT and Premier in the Tahoe and Suburban hierarchy. They’ll undoubtedly be higher. How much depends on both typical year-over-year price inflation and any newly standard equipment GM puts on these vehicles. Our estimated base prices are for rear-wheel-drive models and include manufacturer destination fee, which was $1,295 on the 2017 Tahoe and Suburban. 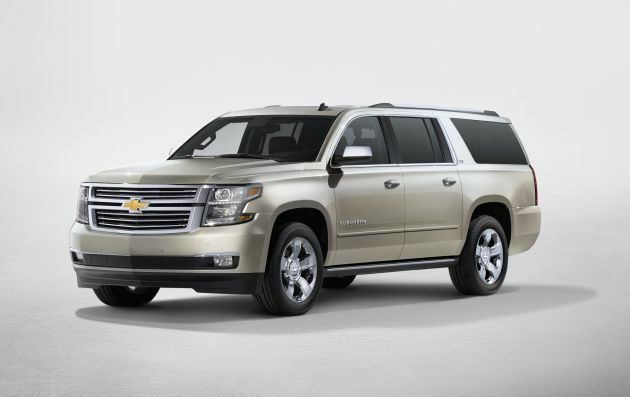 The Tahoe LS will likely start at about $50,000, with the LT checking in at around $55,000, and the Premier at $65,000. We project the RST to carry a base price of around $58,000. Comparable Suburban models will likely be about $2,500 more than their Tahoe siblings. Add another $3,000 for 4WD. Chevy will offer a few extra-cost paint colors that will range from $395-$1,000. The Enhanced Driver Alert Package, which is $695 on the 2017 LS, should hopefully become standard on all 2018 models. It includes the aforementioned lane-keep assist and forward collision warning, along with power-adjustable pedals. Vehicles so equipped would be eligible for Top Safety Pick+ status from the influential Insurance Institute for Highway Safety. As of this writing, the organization has not performed any of its crash testing on the current-generation Tahoe or Suburban. LS models should also offer the $2,580 All-Season Package, which adds 20-inch wheels, body-color side moldings, all-season floor and cargo mats, and heavy-duty trailering gear. Most buyers are apt to choose an LT. The $2,995 Luxury Package would add power release for the second-row and power folding for the third-row, keyless access with pushbutton ignition, power tilt and telescopic steering column, driver-seat memory, heated steering wheel, hands-free power liftgate, front- and rear-obstacle detection, blind-spot with rear cross-traffic alert, and wireless smartphone charging. Buyers in the Lone Star State will have to spend $3,245 for this package, dubbed Texas Edition. The extra $250 is for large Texas Edition badging all over the vehicle. For $6,770, the LT Signature Package adds 20-inch chrome wheels and chrome cladding across the front, sides, and rear of the vehicle. The $1,835 Midnight Edition nets black exterior trim and wheels. The Sun, Entertainment, and Destinations Package ($2,885-$3,480) adds embedded GPS navigation, a power sunroof, and a rear-seat entertainment system with support for Blu-ray movies. The 2018 Chevrolet Tahoe and Suburban should arrive at dealers by the end of calendar 2017. GM’s excellent eight-speed automatic transmission as standard equipment on most models, along with key driver-assist features would be the most welcome additions to these big rigs. We expect the company to do this. The RST represents an interesting twist on the big SUV formula. We’d like to see how it compares to the sporty Dodge Durango R/T.